One of our readers asked yesterday about what the Dow Jones Industrial Average would look like if it was not price weighted. 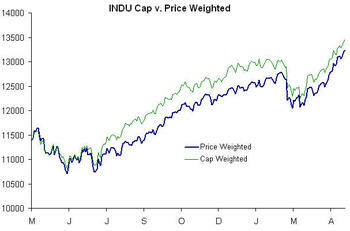 Below we have recreated the index using a shares outstanding v. price weighting system similar to the S&P 500. (The "Price Weighted" line represents the actual index.) In order to calculate the new index, its initial price was set equal to the value of the DJIA on 5/3/06, below represents one year. We noted that the weight of each individual stock can be quite different, but the overall performance of the index is relatively unchanged. The cap weightings aren't even close to correct. Better check your figures. The index is weighted as shares outstanding x price. The same way the S&P 500 is weighted. Older companies that have slit, such as GE, then constitute a much larger percentage weight in the index because there are only 30 stocks. Anonymous, upon further inspection the weighting table was not correct. I had thought you were talking about the chart, which is correct. The table is updated.